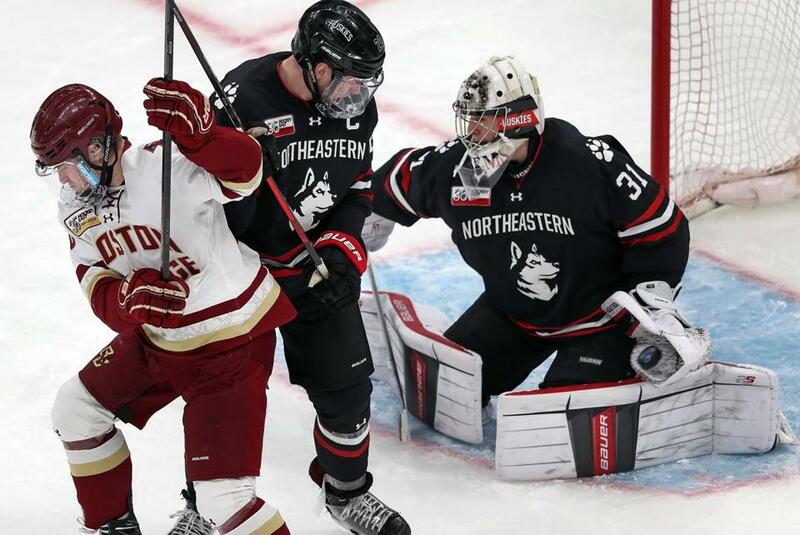 Catden Primeau stopped 33 shots in the Beanpot championship game, including this glove save with BC&apos;s Julius Mattila and Eric Williams in front of him. 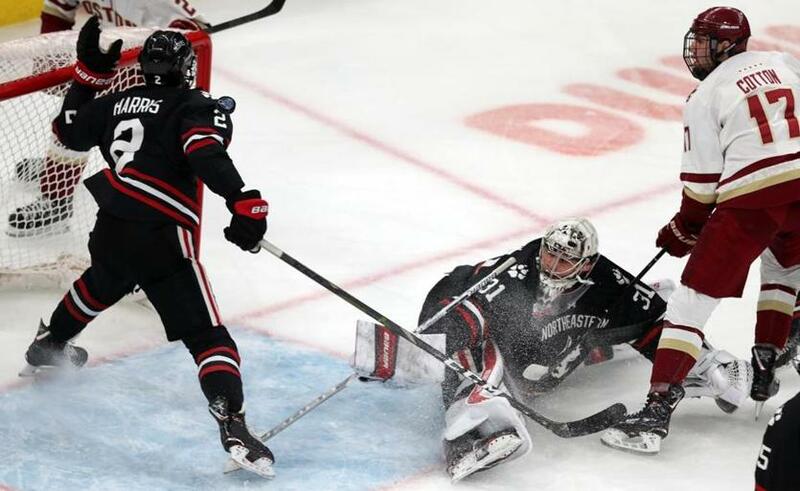 When the clock still showed 14:59 to play in the third period, Northeastern was in complete control, a two-goal lead on its side and a second straight Beanpot trophy in its sights. But in that moment, with goaltender Cayden Primeau sprawled on the ice, his outstretched leg on the wrong end of a collision with both a hockey stick and an oncoming hockey player, what seemed so secure was about to unravel. “It was a play they tried to go to back door, the guy was crashing the net, and hit me in the groin area. It was a little bit of a stinger,” Primeau said. Trainers came out on the ice, teammates skated up to check on him, and the pulsating atmosphere inside TD Garden held its collective breath while Primeau attempted to right himself. “I wasn’t ready to come out at any point,” he said later. They would have had to drag him off. No, the sophomore Primeau would stay on the ice, but if his confidence remained high, forgive the Northeastern faithful if they didn’t quite share his certainty. Would he be the same? Could he continue to hold off Boston College, which had woken from a two-period slumber to unleash a barrage of offense in this final period? On came the Eagles, shot after shot, taking up residence in Northeastern’s end, peppering Primeau with their relentless attack, clogging the offensive end as they fought back into the game. One goal had already cut the deficit to two. Another cut it to one. A pulled goalie to gain the extra-man advantage. If there’s little in the sports world that can match third-period hockey for drama and anxiety, this emotional college clash was certainly doing its part, thickening the air with tension. BC thought it had a first-period lead on this puck that got behind Primeau, but it was disallowed on replay review. But in the end, Primeau prevailed, leading the Huskies to a second straight Beanpot championship, earning a second straight Eberly Award for the tournament’s best save percentage. Winning his first MVP by guiding his team through that wild, intense, nerve-shredding third period, when a final empty-net goal by teammate Zach Solow secured a 4-2 victory over the Eagles. Primeau, the son of former NHL star Keith Primeau and draft property of the NHL’s Montreal Canadiens, made 59 saves on 62 shots across his two Beanpot games, a .952 save percentage that never looked better than in that third period on Monday, when BC pummeled him with 28 shot attempts. But he was ready. He’d done this last year on this same Garden ice. He spent the holidays helping his World Junior team to a silver medal. He’d matured, and having enjoyed the taste of success, wasn’t about to give it away. What a time it is for Huskies hockey. For the head coach Madigan, what a legacy he is cementing. Remember, Madigan is a Northeastern guy, through and through. He went to school there, played hockey there. He met his wife there, returned to coach there. He put two daughters through school there. But across these last two years, from a breakthrough Monday night a year ago, Northeastern’s first Beanpot title in 30 years, to an emphatic encore one at TD Garden this Monday, Madigan pushed his profile even higher. If the day began with all the coaching plaudits heading the way of BC’s Jerry York, who signed a contract extension through the 2021-22 season — plenty of time to add to his NCAA best 1,063 career victories over 47 seasons, the last 25 at his alma mater — it ended with them headed Madigan’s direction. Madigan is connected to five of the school’s six Beanpot championships: A player on the last group to go back-to-back (1984-85), an assistant coach in 1988 and the head coach for last year’s drought-ender, making him just one of three people in tournament history to win as a player, assistant coach and head coach, joining Boston University’s Jack Parker and David Quinn. But as he insisted afterwards, this was a night for the university. For the students, for the alumni, for the administration and the fans, and mostly, a night for the players. For guys like Primeau, who took control early and held on for dear life to the end. Primeau dives for a stick save on BC’s Aapeli Räsänen during the third period, one of 13 saves he’d make to secure another Northeastern championship.